Bikram yoga is one of the most popular forms of hot yoga. Sweating your way to a trimmer and healthier body in hot yoga can leave you feeling invigorated and healthy. But hot yoga can also cause muscle soreness, particularly if you've just started yoga or have an injury. There are several things you can do to minimize the risk of injury and to treat pain when it occurs. If you have chronic or severe shoulder pain, consult your doctor. Heat improves blood flow and gets your heart working, so hot yoga can improve circulation, help you shed additional calories and increase the blood supply to your muscles. However, the heat of hot yoga makes participants especially prone to dehydration, a common cause of muscle soreness. Dehydration also increases your risk of injury, so if you feel cramping during yoga you may need to drink some water. Improper form can increase the impact on your shoulders and may cause short-term pain or longer-lasting injuries. Hot yoga advocates claim that it warms muscles quickly, enabling them to stretch more. This rapid stretching could increase your likelihood of overextending your muscles, causing shoulder pain. Because yoga frequently requires you to support all or most of your body weight with your hands and arms, it can exacerbate shoulder injuries. 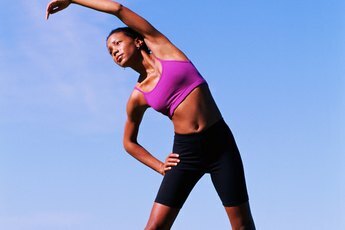 If you slip in a pose or don't use proper form, you may end up with a shoulder injury. The rotator cuff -- a tendon in the shoulder -- can easily be injured if you balance on your hands and slip or distribute your weight improperly. Disuse can also cause pain when you go back to yoga. Myofascial trigger points -- knots in the muscles -- commonly cause pain that radiates throughout the body. Back injuries can cause your shoulders to bear weight improperly and may cause shoulder pain. Massaging the affected area can greatly improve the pain, particularly if the pain is not caused by an injured ligament or tendon. Try pushing gently on muscle knots. It should be painful to do so but not unbearable, and massaging knots can help alleviate tension. In the first 48 hours after an injury, alternate 20 minutes with an ice pack followed by 20 minutes with a hot pack, with a break of 10 minutes in between. This increases blood flow to the area and can reduce swelling and shorten healing time. Nonsteroidal anti-inflammatory drugs such as ibuprofen can help relieve pain and may reduce swelling if taken in the first few days after an injury. Avoid overexertion until the pain goes away, but don't resign yourself to becoming completely sedentary. Stretching, lifting very small weights and other gentle exercises can prevent stiffness and ease pain. If exercise hurts or you hear popping, consult your doctor. To prevent injuries, it may be best to start with yoga at room temperature and then gradually build up to hot yoga. Ask your instructor to help you adopt proper poses that don't increase your likelihood of injury. If you have chronic shoulder pain, you may need to avoid yoga poses that put weight on your shoulders. Drink plenty of water before and after hot yoga, and stretch and warm up before any yoga session. Myofascial Trigger Points; Jan Dommerholt et al. Time: Is it Hot Yoga or Just Balmy? Can Pushups Be Done for Tendinitis in the Shoulder? 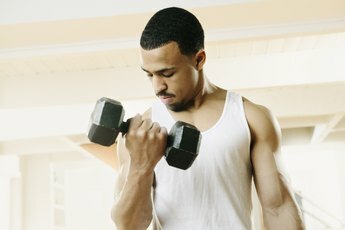 What Are the Best Stretches Before Lifting Weights? Does Yoga Help With Stiff Shoulders?